The January 2014 issue of the Aquaponics Survival Communities magazine will have my latest “Aqua-ponderings” column. This month I am going to discuss what I think are some of the most common “Newbie” mistakes made in Aquaponics. #1. Not enough patience to wait for the system to cycle properly. 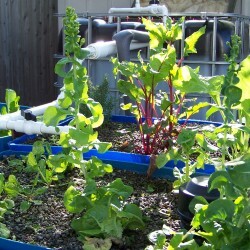 I personally think that this is the root cause of the vast majority of issues that people have with Aquaponics. Simply not having enough patience. The truth is that getting the system up and running is often so exciting, that many people (me included) just cannot wait to get the fish into the tank and the plants in the beds. I will admit, I have been bitten by the impatience bug several times myself, and every time the result was an error that ended up causing me more of a delay than if I had just been patient. This impatience leads to a critical system imbalance and then the inevitable system failure and crash.